The Jetstream radio is a great and cheap addition to anyone who may need to DF an ELT or EPIRB. Unfortunately, they are no longer sold from Radio Shack. They are frequently available on eBay, however, for $5 to $10 plus shipping. Read the following to learn more about the radio and some of its various uses. The Jetstream radio is simply an inexpensive receiver for the aviation band. It can be used for simple direction finding techniques known as "body shielding" or "body blocking." These techniques are discussed in ground team training materials. They are applicable to wilderness SAR crews, aircrews, and urban direction finding teams. 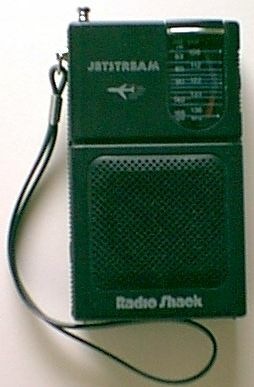 The Radio Shack AM/FM/VHF-air Pocket Radio, or "Jetstream Radio," was catalog number 12-615. At last offer, it retailed for $24.99. The radio included an in-ear bud type earphone. Its a cheapie thing, but it could help when trying to DF in a noisy environment. The earphone jack can also be utilized for a power meter. This model of Jetstream radio requires 3 AA batteries or a 4.5V DC adapter. The VHF-AM frequency range is 107 to 136 MHz and the radio can therefore receive VOR, tower, ground, ATIS/ASOS/AWOS frequencies as well as ELT, EPIRB, and practice beacon frequencies. The radio also receives standard AM & FM broadcast bands. Your Jetsream Radio will receive an ELT at about 1 mile, 2 miles maximum. Another use for this unit would is for flight line crew during a mission. Flightline personnel can use it to monitor tower or Unicom frequency, thereby hearing when a CAP aircraft is approaching. The tuning will have to be adjusted at the beginning of the day and the frequency will be lost if the dial is turned. The old Jetstreams use a singular 9V battery which can be swapped with an L-Per battery if need be. Additionally, it did not have the FM-AFC feature which allows for a better "decrease in sensitivity" by off-frequency tuning. AFC pulls the radio tuning onto the received frequency, making it easier to aquire the signal but more difficult to attenuate the signal by tuning off-frequency. Additionally, the older radio does not have FM at all. In addition to eBay, try looking for the old radios at ham fests, rummage sales, etc. At the left we see the youngest (black) Jetstream radio, then an older generation radio, and finally a middle generation Jetstream. They all work adequately. The newest radios typically receive the ELT the furthest out. The analog (knob, not digital) tuning of the Jetstream radio necessitates "calibration" prior to SAR use. When you buy a new Jetstream, you'll need to mark the dial at 121.5 MHz. It should be easy to tune the radio until a strong signal is heard but it is not possible to exactly tune in 121.5. In other words, you shouldn't use your Jetstream to definitively determine whether or not an ELT is operating in your location. 121.5 MHz can be approximated by using 121.775 MHz, the practice beacon frequency. Mark your radio's dial by scratching a line on the window plastic with a pocket knife. You'll soon find that your mark will be plenty "accurate," although you'll need to tune around a tiny bit - "by the fraction" - during any search. You can also try taking a big piece of tape and putting it over the tuning knob and leaving the tape in place until your next actual or training mission. A good signal generator give you the actual frequency to mark, but you'll have to find someone with that expensive equipment. To complicate matters, remember that each ELT will broadcast on a VERY slightly different frequency, though this will not be noticeable to Jetstream users. In addition to using off-frequency tuning to "decrease sensitivity," you can also simply shorten the telescoping antenna. This reduces the overall signal coming into the radio and should help to give you a sharper null when you need it. In general, however, the best technique for body shielding is allowing a full antenna and tuning off-freqeuency. Store your batteries outside of your radio in a ziplock type bag. Corrosion will otherwise occur when packed inside of a flight bag or field gear. Additionally, its a real bummer to pull out your radio only to find it somehow was packed in the "on" position, thus completely killing your batteries. I have found that an old MRE bag (the thick plastic ones) will work well to store your radio. Put the radio inside, fold the bag over itself, and secure the whole thing with a rubber band. That makes a tough and watertight seal. It may be possible to use a Jetstream radio as a receiver for a home-made (homebrew) DF unit. See the Build a DF pages or Joe Moell's Transmitter Hunting: Radio Direction Finding Simplified via the links on this site. You will still run into the tunability problem. I recommend each CAP member purchase his or her own Jetstream. They're certainly cheap enough, and if you're comm-out during air-ground coordination, you might still have a receiver. This would need to be prebriefed between the ground team and aircrew, but it only takes someone saying, "if we're unable to communicate on CAP-FM, we'll listen on 123.1 MHz (122.9 practice) for the aircrew." The aircrew only has to tune one of its comm radios to 123.1 and talk to you, albeit one-way. If you are DFing on 121.5 or 121.775, the aircrew may also try to talk to you by talking over the ELT. This has been tested and works very well for one-way communication. Here's a forward-thinking thought: you're a member of an aircrew that has located survivors. You want to talk to them to let them know that more help is on the way. Luckily, you've preplanned for this event. You've tuned your Jetstream to 123.1 MHz and taped it down as described above. You've made a note that says, "TURN THIS RADIO ON AND LISTEN." It has nice friendly arrows pointing to the volume-on-off switch. You've prepared a drop container (as described on the airdrop page) with other goodies such as water, first aid gear, etcetera. You've padded the container and limited the total weight to less than a pound. You put a streamer on it like an orange gore or two of parachute (standard C-9 canopy). Your mission pilot flies over the survivors and you open the window of your trusty airplane. You place the bag outside the aircraft and drop it when the strut crosses the target. The streamer unfurls, the bag lands, the survivors open the pack, follow the instructions, and turn on the radio. Now you tell the survivors nice things by using the radio (Hi, I'm Scott from the Civil Air Patrol. Someone will be by shortly to bring you home!). All you have to do is transmit on 123.1 MHz. If the radio breaks on descent, you're only out the few dollars that you paid for the radio. This scenario may sound farfetched and/or antiquated, but dropping supplies to downed aircrews has been done for many years and continues today in professional air SAR organizations. If it was me on the ground, I'd be pretty darn happy to hear from you. I've got my old Jetstream packed in a metal container that's slightly larger than the radio. The metal box has a hinged locking lid. The outer case provides an additional measure of crossover signal shielding, and it still fits in a field jacket pocket. Now, the frequency cannot be bumped accidentally in the field, but it can be easily adjusted by flipping open the case. The telescoping antenna has been removed, and the leads hardwired to a BNC connector on the metal case. To this, I attach various sizes of rubber ducks, a handheld directional antenna, or to the magmount on the car. I can put the thing in a top pocket of my field jacket, plug in the earpiece and, to the amazement of all the uninitiated, walk right up to the offending transmitter. this section courtesy Dan Root Pretty good for a "cheapie" radio! There is a project that can be constructed dubbed "the Bromstead Box," named for Illinois Wing's late Late Leonard Bromstead. The Jetstream is placed in a metal box with a meter to the audio and a PL-259 antenna connection. The radio is shielded by the case. A Telescoping antenna is soldered to a SO-239 connector and placed on the PL-259. The antenna can then be extended and turned while parallel to the ground. If there is no null after a full turn the user can retract antenna one section. The user then repeats this process until two nulls are received 180 degrees from each other. The deepest null is when you are 180 degrees away from the target, directly to your back. This is when the smallest antenna surface is used, plus the blocking of your your body. For you techies out there, Chris Johnson, N1SZF, submitted procedures for obtaining technical data on the Jetstream radio. You may still be able to get a copy of these schematics by mail. Contact Radio Shack at 1-800-THE SHACK and request document number 12-615 (NEW FCC). If the person you're speaking to can’t help you, get transferred to Susan Black or Verdene Hill. To get a copy of the IC data sheets (Toshiba TA7613AP) call Toshiba America Electronic Components, Inc at (714) 455-2000, ask for Suzie Carpenter, and ask for the Data Sheet for the TA7613AP. Click on the sheet to view it full size, or right-click and save the picture.